pour starter into mixer mixing bowl, add salt, sugar, milk, and butter to the starter and mix well with flat beater attachment. Switch to dough hook. Add whole wheat flour and mix well. Add all purpose flour 1 cup at a time, finish adding flour on lightly floured board. Knead until smooth and satiny roughly 15 minutes. Proof dough overnight at room temperature in a lightly greased bowl, covered with plastic wrap. Allow dough to double, 8 to 12 hours. When dough has doubled, gently ease ball onto lightly floured surface. Let rest for 30 minutes. If flattening occurs, knead in extra flour before shaping. After 30 minute rest, shape the dough into a ball. 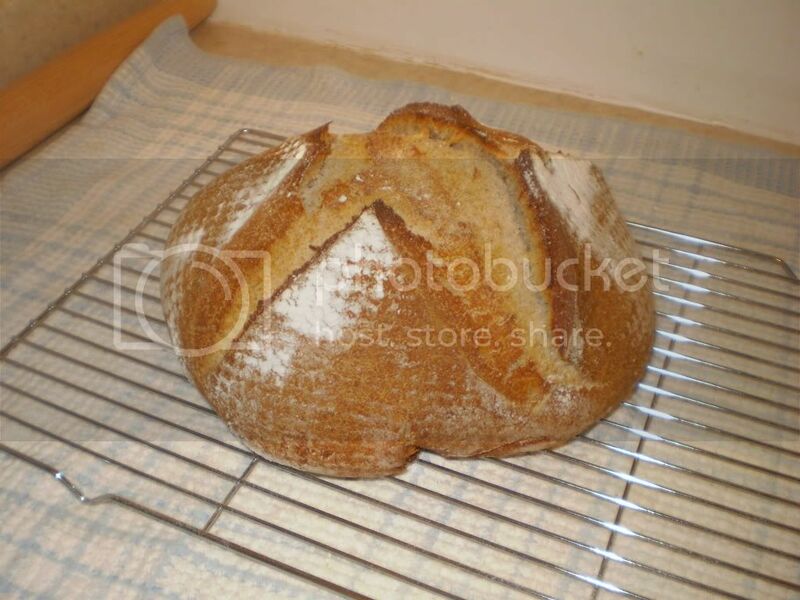 Place in well floured brotform and cover and allow to proof, 2 to 4 hours at room temperature. Preheat La Cloche in oven at 500 degrees fahrenheit. 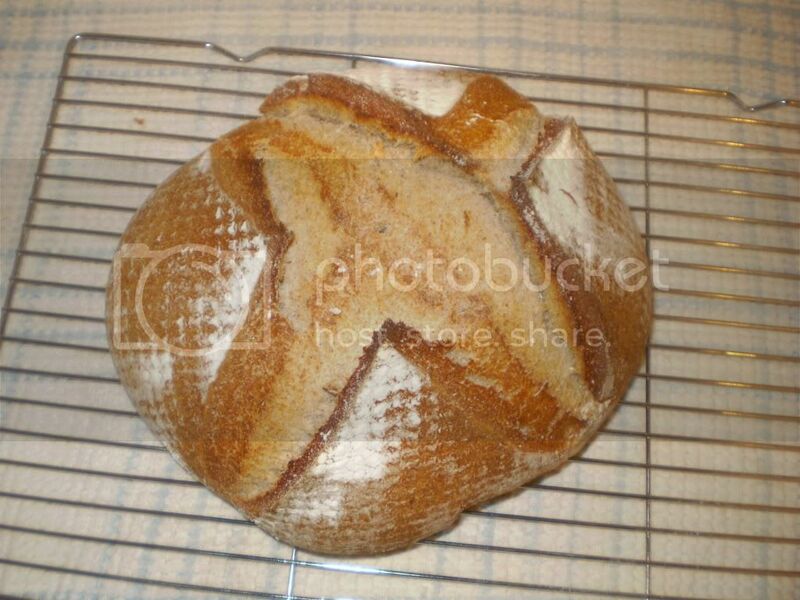 Remove dough from brotform and cut an x in the top of the loaf at a 45 degree angle roughly 1/2 inch deep. 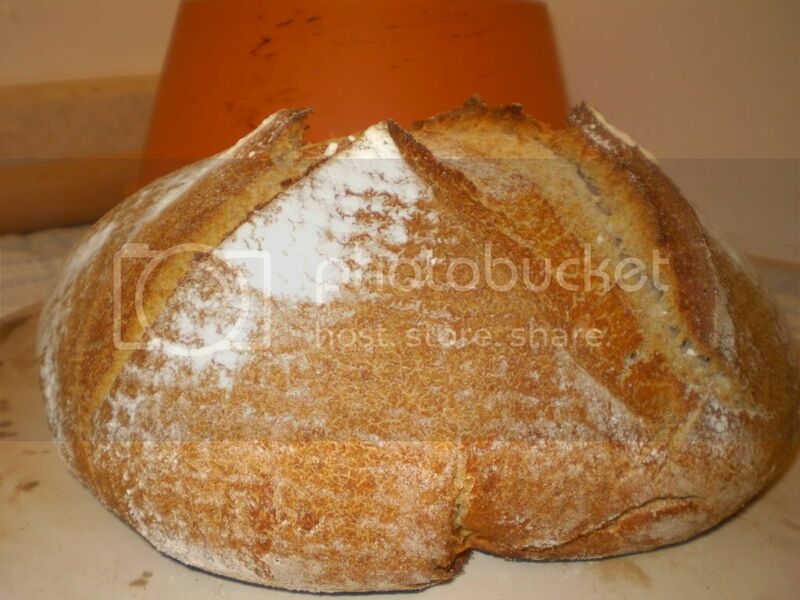 Place loaf in La Cloche and bake for 20 minutes. 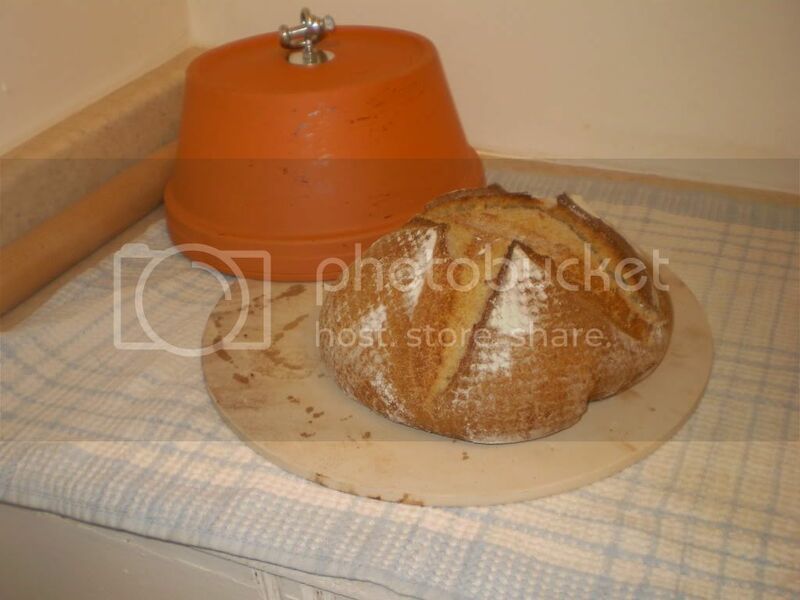 Remove La Cloche cover reduce oven temperature to 400 degrees fahrenheit and bake an additional 15 to 20 minutes until loaf is dark brown and a temperature of 205 to 210 degrees fahrenheit is reached when using a thermometer inserted into center of loaf. Allow to cool completely on cooling rack. I used a whole wheat sourdough starter for this recipe, but any starter will work just fine as long as it's VERY active. Wow! You have been busy. Did you bake all four loaves in one day. Everything looks great, but I especially like the sourdough and the English muffins. Would love to see some crumb shots if it is not too late. Great baking. will take some of the whole wheat....not allowed to cut into it until the girlfriend returns from Florida tomorrow!!! and it's killing me not too!! lol.....as for the english muffins they were baked 2 weeks ago and never got a chance to take a pic of one after it had been split....I make them quite frequently so i'll be posting crumb shots of all my newer posts....thanks for the compliments thou Syd..cheers! just made my first whole wheat sour dough country loaf from my week and a half old starter made from whole wheat flour, and WOW is it tangy and sour!!! never had a bread like this before...it has a terrific after taste, can't wait to put some nice sweet preserves to it!